There was confusion in the All Progressives Congress at the weekend as it rounded off it primaries and struggled to meet the Independent National Electoral Commission’s deadline for the conduct of the shadow elections. In spite of Sunday’s (today) deadline given by INEC to political parties to conclude their primaries, as of Saturday, the APC was still battling with crises, which could prevent it from fielding candidates for some elections in 2019. 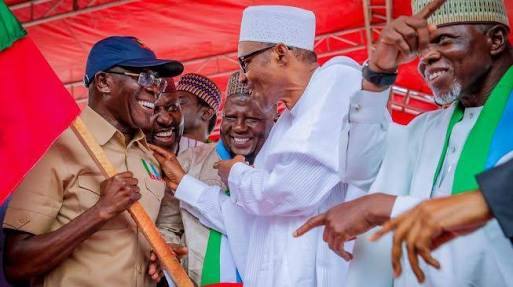 The Punch’s investigations revealed that the APC governors were angry with the decisions of the Adams Oshiomhole-led National Working Committee on the list of aspirants and the conduct of primaries in their states. States where governorship primaries were conducted on Saturday included Adamawa, Zamfara and Imo. The NWC on Saturday dispatched a panel to Gusau, the Zamfara State capital, to conduct a fresh governorship primary, a few hours after a threat by the state Governor Abdulaziz Yari to resist any panel sent to the state. The NWC had on Friday sacked the party leadership at all levels in the state. It cited a subsisting court order as reason for its action. But the party’s Deputy National Chairman (North), Senator Lawal Shuaibu, faulted the dissolution of the Zamfara chapter of the party. In a statement in Abuja, on Saturday, Shuaibu said the report that the party executive in the state had been dissolved was untrue. He explained that while it was true that there was a subsisting court order, the order was to the effect that the disagreeing parties maintain the status quo. According to him, the order states that the parties should not take any step that will render nugatory the subject of the litigation. He said, “In that regard, the NWC and the party in the state were served and the national headquarters can therefore not take any action except to ensure members of the executives do comply. He noted that the exercise started in most parts of the state on Wednesday, but thugs invaded some wards to disrupt the process. Shuaibu added that the committee announced the cancellation of the entire process when collation of votes was already ongoing in more than 10 local government areas. Also, Yari, faulted the dissolution of the state executive committee of the party by the NWC. According to an online newspaper, The Cable, Yari, asked the panel the NWC set up to conduct a fresh governorship primary, not to visit the state. The governor accused Adams Oshiomhole of working against the interest of the APC. He said, “We have barely less than 52 hours by the guidelines of electoral act 2018 and we are still here with no member of the committee to conduct the primary election. The APC national chairman announced through the publicity secretary the dissolution of party executives. “Though they have sent the counter release that what they mean is that the state executive should not take part in the processes of primary elections in Zamfara State, that we have no problem with. But the lawmaker representing Zamfara Central senatorial district, Senator Kabiru Marafa, hailed the NWC for intervening in the crisis between the two APC factions in the state. Marafa said barring factional executives of the APC in Zamfara from the exercise was the right thing to do. A human rights group, the centre for community Excellence, expressed concerns “over the volatile political situation in Zamfara”, warning that the state was on the verge of bloodshed. The letter was addressed to Global Rights, Amnesty International, Human Rights Watch, National Human Rights Commission, International Criminal Court and Human Rights Network Agenda. In Adamawa State, a former Chairman of the Economic and Financial Crimes Commission, Mallam Nuhu Ribadu, and a brother in-law of President Muhammadu Buhari, Mahmood Halilu, called for the cancellation of the APC governorship primary in the state. As of the time of filling this report at 8pm on Saturday, results of the primaries were still collated, but Ribadu andHalilu rejected the election, saying the rescheduled primaries which started late on Friday across 226 wards in the state were marred by irregularities. The state Governor, Jibrilla Bindow, who is facing a stiff challenge for the Adamawa governorship ticket from Ribadu and Halilu, was leading in the official results so far released by the electoral committee headed by Major Gen. Lawrence Onoja. Halilu, a younger brother of Aisha Buhari, described the rescheduled direct primary as a charade, adding that Bindow, through some party agents, hijacked the process. He also lamented the late arrival of electoral materials as responsible for the primaries proceeding into the night. He added that the governor used the cover of darkness to award figures in his favour. Halilu also urged the Oshiomhole-led NWC not to allow the result of the election to stand, stating that it violated outlined guidelines for its conduct. Also, Ribadu urged the NWC to cancel the exercise. He observed that no accreditation took place anywhere in line with the guidelines stipulated for the conduct of the exercise. In Ogun State, a former Deputy Governor of the state, Senator Gbenga Kaka, has petitioned the national chairman over the governorship primary in the state. A businessman, Dapo Abiodun, won the primaries conducted by the NWC panel, while a member of the House of Representatives, Mr. Adekunle Akinlade, emerged victorious in the election conducted by the state chapter of the APC. Kaka, who was one of the aspirants that opposed the primary conducted by party’s state chapter, also faulted the one conducted by the Muhammed Indabawa-led panel which declared Abiodun as winner. In the petition titled, ‘Ogun State primary election that never held’, Kaka said that there was nowhere in the 236 wards in the state where the election held. Another aspirant, Jimi Lawal, earlier submitted a petition to Oshiomhole. In his petition titled, “Petition on a facade governorship election held in Ogun State,” Lawal called for the cancellation of the result of the election conducted by the NWC panel. Both contestants, who are from Ogun-East senatorial district, said they were not part of the party agreement in the state zoning the governorship slot to Ogun-West senatorial district where the consensus governorship candidate, Akinlade, hails from. Kaka stated in the petition that if any governorship primary ever held in the state, it must be in the dream of the self-appointed presiding officers. In Imo, six out of the nine governorship aspirants who contested in the aborted primary on Saturday in Abuja declared the conduct of a fresh primary in the state a nullity. They said it was done despite a subsisting court order. Spokesperson for the group and Deputy Governor of Imo State, Eze Madumere, said critical stakeholders in the election agreed that the election had already been conducted and that the result ought to be released. He said, “The result of the primary conducted by Ahmed Gulak, signed and agreed to by the majority of the aspirants which declared Senator Hope Uzodimma winner should be declared. “As I speak to you, some of you may be aware and may have watched on TV that elections are going on. I can tell you that there is nothing going on in Imo State. The result, as I speak, has already been written and waiting for submission today. The presumed winner of the botched primary, Senator Uzodimma, said six out of the nine governorship aspirants were not in Imo for the rescheduled election.